This week was exciting – we deployed a first prototype of a minimal ARM environment on build.opensuse.org in the repository Base:build:arm. It’s a set of packages which is capable of bootstrapping itself and still in an early stage as it’s using full emulation. Next station: speed-up ! I submitted also some patches for inclusion into the openSUSE Build Service. One of these patches will help us to a address an issue with rpmbuild when doing builds for the ARM architecture. What has openSUSE-Edu project been up to these days? openSUSE-Edu team has been working hard to polish the various image “flavours”. The latest addition to the images is openSUSE-Edu-Desktop. This image contains the latest GNOME with many useful educational applications. David “Nubae” Van Assche, has been busy as a bee 😉 bringing most comprehensive Sugar suite to openSUSE, you can find Sugar, Fructose, Sucrose, Honey and all other sweet tooth satisfying goodies in our repository. Try “Tam Tam Jam”, even grown ups will be whiling away hours having fun. 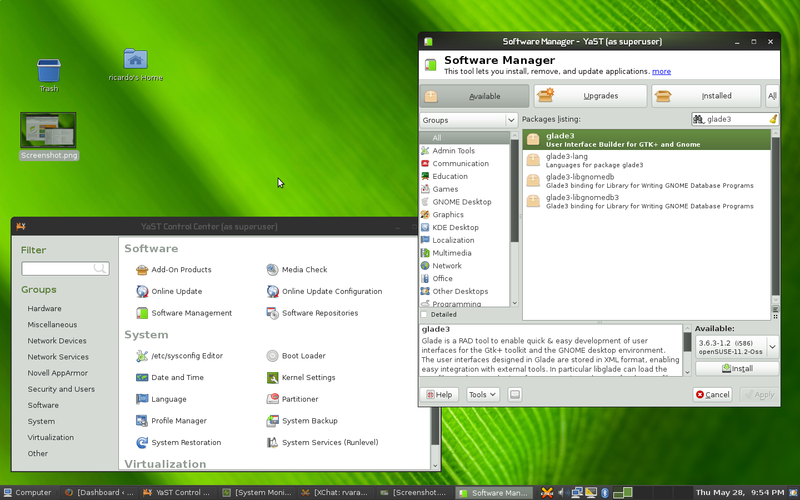 Sugar can be installed on standard openSUSE 11.1 giving another session at login just as KDE/GNOME. Live CD is also under development, if you want to check out things to come get openSUSE-Sugar-live-unstable iso from here(mind the -unstable). Thanks Nubae, Alsroot and all the Sugar developers for the great work. Let’s make openSUSE-Edu the best Li-f-e experience. In the last days I had a closer look at the oauth rails plugin which requires some methods from the restful_authentification module. As the obs frontend doesn’t use this module we need to provide our own implementations of these methods. Fortunately it only uses a handful of methods (like authorized?, login_required, logged_in?, current_user etc.) so it shouldn’t be too hard to get it working without the restful_authentication module. Another thing on my todo list was to look for possible workarounds for the session fixation attack. According to this thread it’ll be fixed in a new revision of the oauth spec. So after the user grants access to a specific application the oauth provider redirects the user to a callback url (if it’s specified by the consumer). Additionally it adds a parameter to this url (called oauth_verifier) which has an unpredictable value – so an attacker has no chance to “take over the session” (this is just a short summary – for more details have a look at the spec). Last but not least I finished the test application and played around with it. Btw. my mentor pointed me to an interesting railscast about authlogic – it gives a great overview about this module. Almost one year ago, the openSUSE Project launched the openSUSE forums as a merger of former suselinuxsupport.de, suseforums.net and the openSUSE support forums at forums.novell.com. Right from the beginning of this project, I served as the Project Manager and afterwards contributed as a Moderator at the OSF to the openSUSE community. Therefore the happenings at the openSUSE forums are certainly in my personal interest. Today, Wolfgang Koller, the founder of former suselinuxsupport.de and one of the three Site Admins of the openSUSE forums, announced his immediate resignation from the OSF staff. I myself feel this as a loss, that is both unexpected and severe. From my perspective, he deserves our respect and appreciation for everything he has done for the openSUSE community and thus this post is dedicated to his person and contribution. Also in answer to his decision, I myself announced my own immediate resignation from the OSF staff as well. Herewith I’d like to make the openSUSE community aware of these recent changes – this shouldn’t happen silently from my perspective. Let me take the opportunity to wish the remaining OSF staff all the best for upcoming activities. Lead the openSUSE forums community into an even better future! I’m happy to announce OpenOffice.org 3.1 rc5 packages. They are available in the Build Service OpenOffice:org:UNSTABLE project and include many upstream and Go-oo fixes. Please, look for more details about the openSUSE OOo build on the wiki page. I have good news for Russian speaking people. One external contributor, with the nick EGD, send me a Russian templates gallery. You might try the package OpenOffice_org-templates-ru in the OpenOffice:org:UNSTABLE project. I’ll put them into the STABLE repository after some clean up.